Just after a terrorist attack on the World Trade Center, on September 11, 2001, a great number of hoaxes have appeared on the net, showing a great cynicism of the internet users. Here are the best-known examples. Born in 1503 in southern France, Nostradamus is an astrologer and doctor. He wrote a famous prophecy book for coming centuries, entitled "Centuries astrologiques". He worked in the court of Catherine of Medici and French king, Charles IX as physician and died in 1566. "In the City of God there will be a great thunder. The third big war will begin when the big city is burning." The quatrain above ("quatrain" is a verse of 4 lines that composes the original text) of his prophecy began to circulate on the internet just after the September 11 attack on New York city but as Nostradamus died in 1566, this prophecy should be impossible. Nevertheless many people tried to find vainly the same quatrain on the prophecy of Nostradamus. 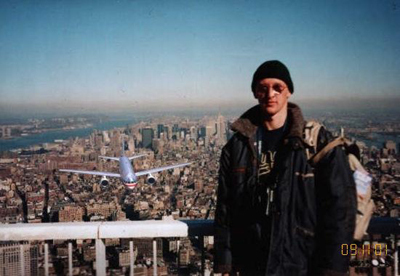 By developing a film found in the wreckage of the World Trade Center, this picture would have been discovered: you see clearly the flight #11 of American Airlines approaching dangerously to the northern tower while a tourist is smiling without doubting of his immediately tragedy. Though the camera has been found intact, the body of the victim himself has been never discovered. You may legitimately wonder why the camera should remain intact after a fall of more than 400m, but the most evident proof of its trick is that the tourist dressed for a winter while the attack took place in early September. Here is one of the hoax messages which appeared on the usenet (newsgroup) just after the September 11 attack. Did you know that a flight number from one of the planes that hit one of the two towers was Q33NY. In MS Word, type in that flight number. Enlarge the font size to 26 (any big size). It is naturally a hoax because none of the flights hit to the World Trade Center carries this number. They are American Airlines Flight 11 hit on the north tower and United Airlines Flight 93 hit on the south tower. For more than 20 years, Afghanistan has been at war. Now American bombings on Afghanistan may provoke a massive refugee exodus and famine. By purchasing post cards of Afghanistan from a charitable organization, you can contribute to save those Afghan children and women from famine and persecution. Afghanistan has been strongly influenced by the Arabic culture like any other Islamic countries such as Pakistan and Iran. Click here to find more detailed description and screen shots on the Arabic tutorial program "Free Light Arabic" and possibly download a free demo version.